Finally, a decent score to a Mission Impossible movie! Well, that’s an understatement. 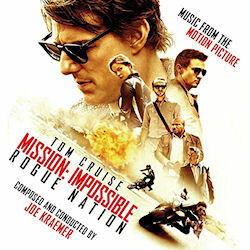 Joe Kraemer’s score to Mission Impossible: Rogue Nation is both suspenseful, inventive, and not least very catchy. He respects Lalo Schifrin’s musical themes and style from the original 60’s series while also introducing great new material, and he elegantly incorporates Nessun Dorma from Puccini’s Turandot. After all, the movie is Mission Impossible at the Opera. It only took five tries to get a good score to an M:I movie, and hopefully Kraemer will also do the next installment as it’s got the same director. Fingers crossed. I was going to point out some highlights, but you really should give the whole score a listen. Enough said—listen to it all here. Here it is, my initial thoughts about the score for the first installment of The Hobbit—An Unexpected Journey—with Howard Shore back in the role as the composer. 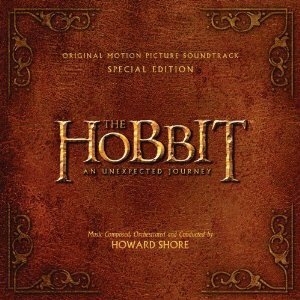 Going straight for the extended Special Edition version of the soundtrack, I sat down and listened for two full hours. Then I listened to the regular version to see if that would make a different experience. It didn’t. Both versions start pleasantly enough with reminiscences of Baggins and the previous trilogy, with a mellow, nostalgic and sentimental sound. After that the music goes on and on and on without really reaching any high point. Of course, the music has its moments, but I was disappointed at their sparsity and short durations. I wouldn’t describe myself as a die hard fan of the previous trilogy, but I’m certainly not among the purists who automatically denounce a movie if it doesn’t follow the book to the letter. The movie version of The Fellowship of the Ring was especially enjoyable, and I listened a lot to its soundtrack which still ranks highly with me. My only quibble was that some of the best themes were underused. In The Hobbit, the best themes are rehashes from the previous trilogy. However, I also noticed some influence from Shore’s score to the 2004 Scorsese picture The Aviator, which was a pleasant surprise. Compared to the Fellowship soundtrack, The Hobbit is less inspired and elaborate with a larger portion of uninteresting background music, and gives a less coherent listening experience. In a recent interview the movie’s director Peter Jackson made a slip of the tongue and disclosed that he’s tired of Tolkien’s universe, and apparently some fatigue has also crept into the score. To Mr. Shore’s defense it was a near impossible task to meet the high expectations after his solid scores for the LOTR-trilogy, and his work on The Hobbit is still better than much of recent film music. The problem is the feeling of having heard most of it before. About one and a half year ago I attended three quite different concerts in rapid succession at two different continents. Even though the concerts were of varying quality, I made some interesting observations which I’d like to share. The first performance I’d like to mention was not really a concert but the opera Iolanta by Tchaikovsky, which was played by the Trondheim Symphony Orchestra under Alexander Vedernikov. Musically it was a pleasant surprise, especially some of the dramatic orchestra playing. I’ve understood the opera is often performed in the composer’s home country, but not often elsewhere. That’s not really a surprise, since the opera is rather short and the story quite corny. Shortly after this I attended a concert performance of Händel’s Messiah. It was performed by the Norwegian Opera Orchestra and Choir, under the baton of Rinaldo Alessandrini. The latter has made a bunch of revitalizing recordings of Vivaldi on period instruments for the Naïve label, which I urge you to check out. Back to Messiah, it was a gripping performance–especially the finale with its fugue and percussions made a great impact. I have since attended another performance of the oratorio in a cold stone cathedral; the acoustics were great, but this time the finale didn’t make as much of an impact. The outstanding factor this evening was the russian mezzo-soprano Alisa Kolosova, whose voice only can be described as addictively soothing. During a trip to Japan near the end of 2010 I attended a concert in Tokyo’s Suntory Hall. It is actually named after a Japanese brewery and opened in 1986 to celebrate the company’s 60th anniversary of whisky and 20th anniversary of beer production. Its acoustics was designed by guidance from Karajan himself, and the sound of the hall was as lush as one could expect. The exteriors of the building were not impressive, but the interiors were nice with pictures in the hallways of soloists from their on-site performance. The man in charge this evening was Sylvian Cambreling, who led the Yomiuri Nippon Symphony Orchestra. They played an interesting programme, with the most substantial works being Schumann’s 4th symphony and Korngold’s violin concerto. The latter was written after the composer emigrated to America to escape jewish persecution, and is based on themes from scores he wrote in Hollywood. The sound of the orchestra could have been grander and I especially missed more power in the symphony, but the solo part of the concerto was brilliantly played by Viviane Hagner. Finish off your fringe day with relaxing hot chocolate and music by candlelight. Programme includes popular choral and chamber music by Bach, Schubert, Ravel and others. The venue, Old Saint Paul’s Church, lies in Jeffrey Street. I have walked this street loads of times, but never noticed a church, and indeed the facade was relatively nondescript, at least at street level. If I had looked up, which I have apparently never done, I would have noticed several tell-tale signs of a church, such as a huge, well-lit Jesus on the cross. In any case, I was genuinely surprised to find a very nice, and quite spacious, old church inside the small door in this not particularly nice street. And actually, as I look at Google Maps now, I can hardly see how the churh room we were just in could fit inside the building in the photo. The music tonight was performed by a woman, Philomena Moffat-Knox, playing the piano, and two young men, Jerome and Alex Knox, singing. I don’t know if they are related to each other, though I’d say they probably are; I also don’t know if they are related to John Knox, who by the way has a house named after him just around the corner from the church. The first part of tonight’s programme consisted of three songs (“Leibesbotschaft”, text by Ludwig Rellstab, and “Der Atlas” and “Der Doppelganger”, written by Heinrich Heine) from Schwanengesang by Schubert. I can’t say I’ve heard any of these before, but I enjoyed them a lot, and as I listen to different recordings now, I have to say the young man (Alex Knox, we think) at the concert certainly sung it better than some people who have CDs out. His voice was deep (baritone) and comfortable to listen to, and had an excellent ring to it. It really suited the venue perfectly. Also, while I found it hard to follow the text, it was obvious that he was really into what he was singing. Even though it was just him standing next to the piano, he performed it as I imagine he would have done if part of an Opera, with incredible facial expressions and the occasional gesture. At times he even leaned on the piano. Moving on, the next two songs were “Ein Mädchen oder Weibchen”, from The Magic Flute, and “Se voul ballare”, from The Marriage of Figaro. These I have heard before, and in particular Papageno’s aria from The Magic Flute (which we saw at the Fringe Last year, performed by Cambridge’s Shadwell Opera, also with a church as the venue) was my favourite of the night. Excellent stuff. Very merry here and there, and very sad in other places. It was performed by the other young man, Jerome, whose voice I found to be even richer and more comfortable to listen to, and again with a certain amount of acting. Next were two songs by Ralph Vaughan Williams, “The Vagabond” (text by Robert Luis Stevenson) and “Menelaus” (text by Ursula Vaughan Williams). Also not something I have heard before, but quite enjoyable, in particular The Vagabond. Being a physicist, and not a student of the humanities, I tend not to think about these things too much, but according to Camilla one could really hear the rythm of a person walking throughout. I suppose I shall have do listen to it again. After this came Don Quichotte à Dulcinée, which is a set of three poems by Paul Morand, with music by Maurice Ravel, and which is appearently unrelated to the multitude of operas, ballets and other works inspired by Don Quixote. The music was written for a film version of Don Quixote in the late 30s, but music by Jaques Ibert was used instead. Again, not something I have heard before, and I didn’t really like it that much. Not that the performance was bad in any way, far from it, I just found these songs to be less memorable than the rest of the programme. Last came three more modern songs: “The can’t take that away from me”, written by George Gershwin, from the film Shall We Dance; “Good thing going”, written by Stephen Sondheim, from the musical Merrily We Roll Along and “A Nightingale sang in Berkeley Square”, by Manning Sherwin. Apart from Nightingale, which is sung in an episode of Torchwood, I can’t say that I remember hearing any of these either before, but according to Camilla I can hardly have avoided hearing “Good thing going” performed by Frank Sinatra. Be that as it may, I greatly enjoyed this more modern end to the concert. As it turns out, “Hot chocolate at ten” runs throughout the festival, but with different music and performers each time. So even if you happen to be reading this in Edinburgh, during the Fringe, it is unfortunately too late to attend this specific concert. I had a look at the programme for the rest of the festival, though, and it looked as if there are several good one still to come. Add in the hot chocolate (which was extremely rich, probably more chocolate than milk), and the nice atmosphere of an old church, and I wouldn’t hesitate to recommend these concerts. See www.osp.org.uk/hotchocolate for programme details. Pinnock’s is the most entertaining recording I’ve heard of Händel’s Royal Fireworks Music. The prominent drums, breakneck tempo and impeccable playing all contribute to making this a winner. Listen to it here. Pinnock and the English Concert also recorded the original 1749 version, without strings, which is interesting to hear but less electrifying. Philips’ Complete Mozart Edition has now been made available on Spotify. Initially released in 1990-91, to celebrate the bicentenary of Mozart’s death (5th of December, 1791), it was the first complete collection of Mozart’s music on recordings. Major contributors include Neville Marriner, Alfred Brendel, Colin Davis, Mitsuko Uchida, Willi Boskovsky, and Arthur Grimiaux. Listen to it all here. A couple of the boxes are still not available on Spotify but I’ll add them to the playlist when available. In this post about Clint Mansell’s score for The Fountain, I compared one track to Philip Glass’ score for The Hours. To me this is one of the truly great scores out there and it’s just as gripping without the film. Another great minimalistic score is by James Newton Howard for the film Signs. Although I’m not generally impressed by the composers efforts, this time he really hit a string in me. Just click on the links, listen to the albums and judge for yourself.